Its a turn-based strategy game based upon political campaigning. Can you see why I may have been interested? The studio making it is based in the Philippines, and led by Ryan Sumo, who you may know as the artist behind Prison Architect. The studio is new, and called squeaky wheel. Its the first time I’m working with a studio in another country, so it will definitely be interesting. For those who weirdly did NOT get the press release…here is some information on the game in non-PR terms.. 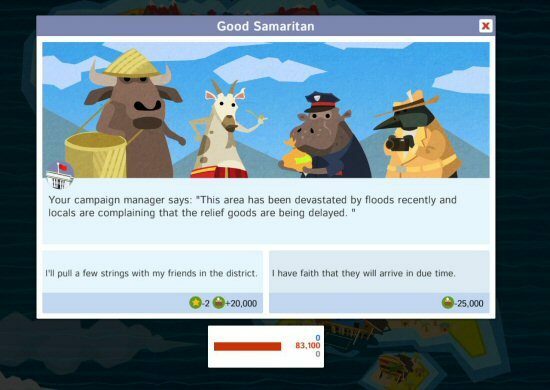 Political animals is an election game, not a government game, and it features a map of a fictional island (there are 3 different maps), and each turn the player allocates tasks to their candidate, and a number of their election staff. Those actions may be moving to a new district, fund-raising, holding a rally or bribing the local patron. Bribery and corruption is a BIG part of political animals. it’s a game of moral choices for politicians. Anyway… unlike conventional political simulations, this one is all about incredibly cute and fun animals. Politics and cute animals obviously mix brilliantly. Just imagine Donald Trump or Hilary Clinton’s speeches coming from a cute animated mouse. See? 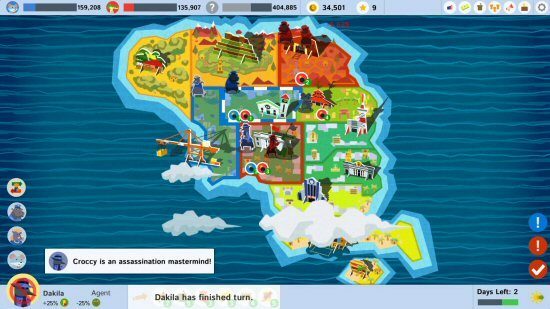 For the eagle-eyed political game obsessives, you will know Political Animals as ‘Party Animals’, a game that’s been in development for a while part-time. When positech agreed to publish the game, we changed the name and switched to full-time development. We already have a fab website for the game, and also the obligatory facebook and twitter accounts. Now I’ve publicly announced my involvement I can talk about it here and on twitter, rather than just mysteriously retweeting lots of Ryans posts over the last six months :D. I’m looking forward to seeing what people think of the game, and how it fits in with us as publisher. We now have Shadowhand & Political Animals in development, plus a mystery thing (first-party) I’ll announce soon. Release-schedule wise, you will see Shadowhand releasing before PA (Are you reading this Jake?) and PA should definitely be in your hands before a certain big election event in the US this year. BTW if you are press and need more information, please email cliff AT positech dot co dot uk. Have benn following this one for a while. Why the name change? ‘party animals’ to many western ears is just ‘someone who loves a party!’ which doesn’t immediately suggest politics. Its a crowded gamespace out there and we wanted it to be immediately obvious to people that its a politics game, not a party game. We were a little worried it might be seen as a “spring break” game. Wasn’t Big Pharma the first game you published?